We need your help to improve the park and realize our shared goals. Donate today! How can I help Murphey Candler Park? The Conservancy is currently working on our 2018 capital campaign. Donated funds will help to implement initiatives outlined in the Master Plan for the Park and continue our Volunteer programs. Please consider making a donation to benefit Brookhaven's largest park. 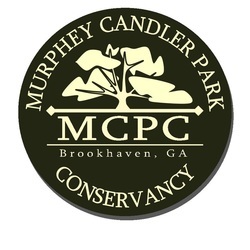 Murphey Candler Park Conservancy was incorporated in June 2012 and is a 501(c)(3) organization. Please consider donating by check. The MCPC has launched a Playground Fundraising Campaign. We are partnering with the City of Brookhaven to bring a new playground for kids of all ages and abilities. The playground will be located on the west side of the lake between the Historic Caretaker's Home and the Pool. Our goal is to raise $100,000. Thanks to a generous $75,000 grant from Resurgens Charitable Foundation, we are well on our way to achieving our goal. Donate Online by clicking on the button below or one of the membership level links. Your support will supplement the City of Brookhaven's master planning, maintenance efforts, and amenities that will enhance the beauty of the Park. Any amount of support is greatly appreciated, but these levels come with a little thank you gift! Other: consider giving at an amount that's right for you! Your support is appreciated! Community Involvement is a Must! Want to get involved? Murphey Candler Park Conservancy is always looking for volunteers with time, talent, and a passion for the Park! From participating in park "clean-up" days to leveraging your professional talents to help make MCPC a success, we need your support. Contact us to learn more about volunteer opportunities!